I like little single-purpose utilities that do one thing and do it well. I regularly make little web apps and prototypes and have come to rely on using the python built-in web server that comes with Mac OS X, for quickly spinning up a local web server without having to deal with configuration. It’s as easy as opening a terminal, navigating to the right directory and typing "python -m SimpleHTTPServer". I wanted to make that even simpler, so I did. The Simple Web Server Mac App lets you drop a folder onto its icon to serve its contents as a static website in seconds. It doesn’t get much simpler than that. Download it here. Enjoy! 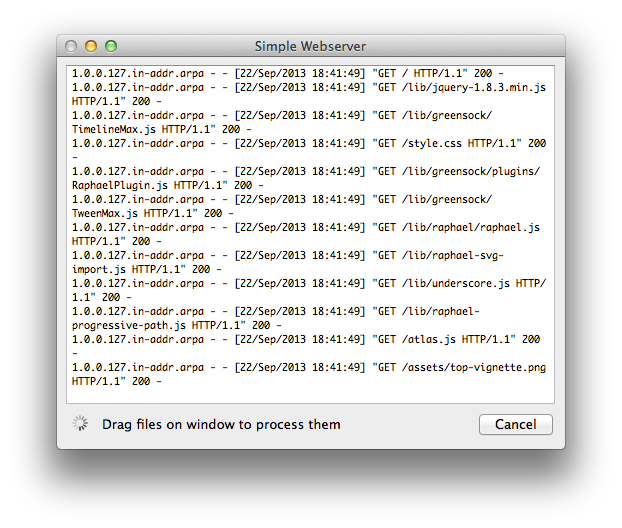 Download Simple Web Server from GitHub. of info written in such an ideal means? I’ve a challenge that I am simply now working on, and I’ve been on the glance out for such information.